With their focus almost exclusively on email marketing and the few features that compliment it, MailChimp is really good at email. Not only that, they make their users really good at making nice-looking emails. The basic functionality between Gist and MailChimp is similar. MailChimp then kind of runs off with their email marketing capabilities after this point. You can create visually beautiful and colorful emails with little to no design skill at all. They have paid plans, but the free plan is really enough for most users. In addition to this, the other features they offer work great with their email tool. 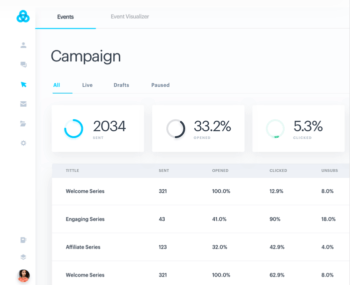 For instance, you can create landing pages with the same ease and emails and you can do basic and advanced segmentation (which we’ll cover more in the automation section). It’s what they do, so we definitely yield to MailChimp’s email marketing platform. If sending emails is all you’re looking for, you may want to go with them. What we label as marketing automation, MailChimp doesn’t necessarily offer. However, they have a feature called “segmentation” which does bare a number of similarities. 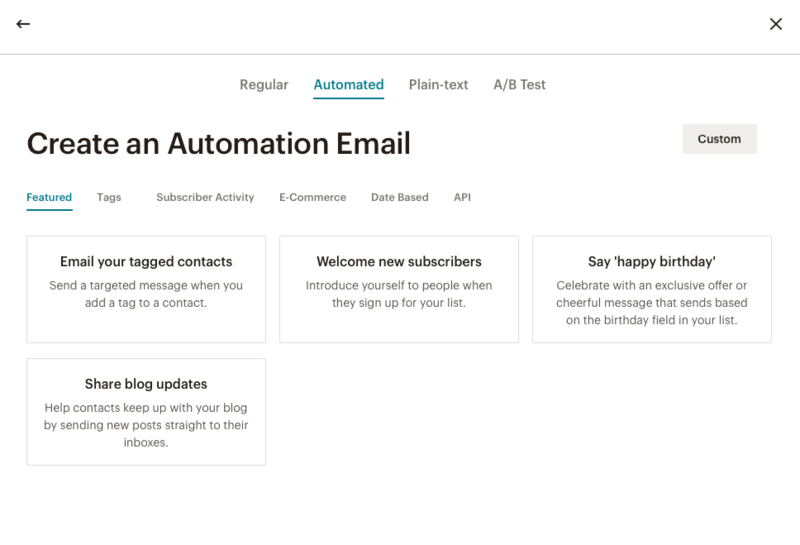 MailChimp offers “basic” and “advanced” segmentation. Basic is available for all accounts, but the advanced capabilities are only on the pro account. 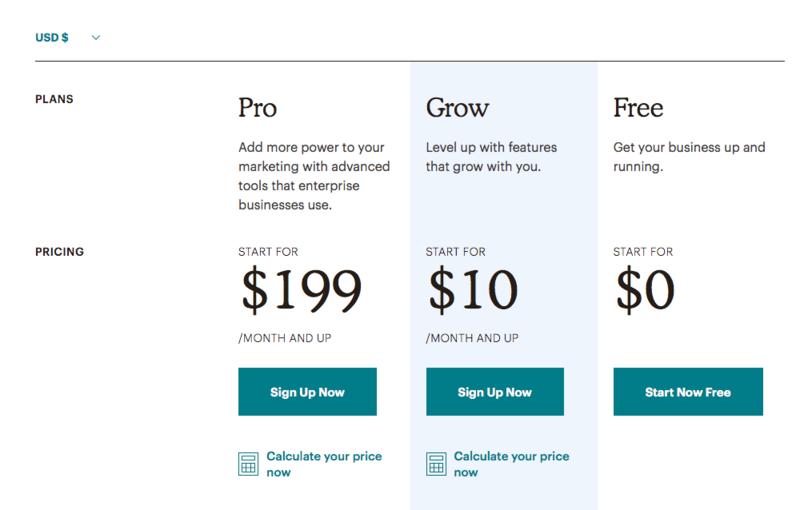 The Pro plan for MailChimp starts at $199/mo. Gist offers all marketing automation capabilities for our Pro plan which is $79/mo. Where Gist begins to pass MailChimp comes from the automation of our other features. Since we offer more than solely email, you can create tags and automations from and for our other tools. MailChimp’s segmentation is really nice and works well with their email tools. 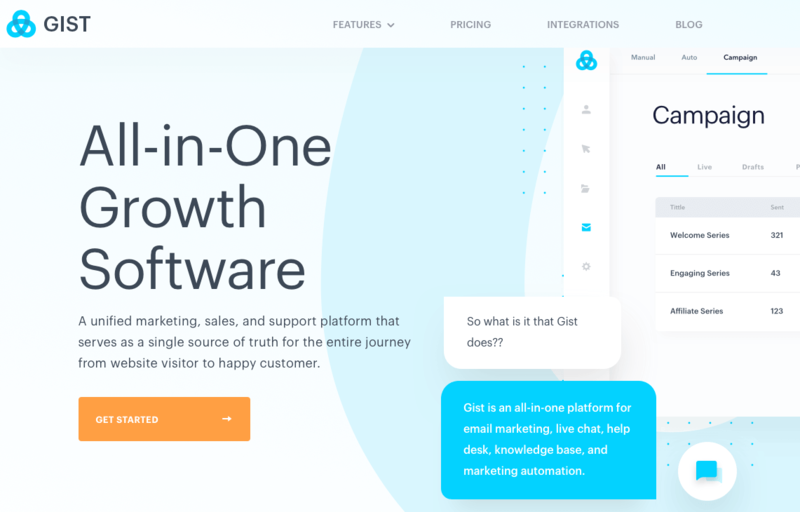 Gist’s marketing automation is a bit more robust and takes the win. 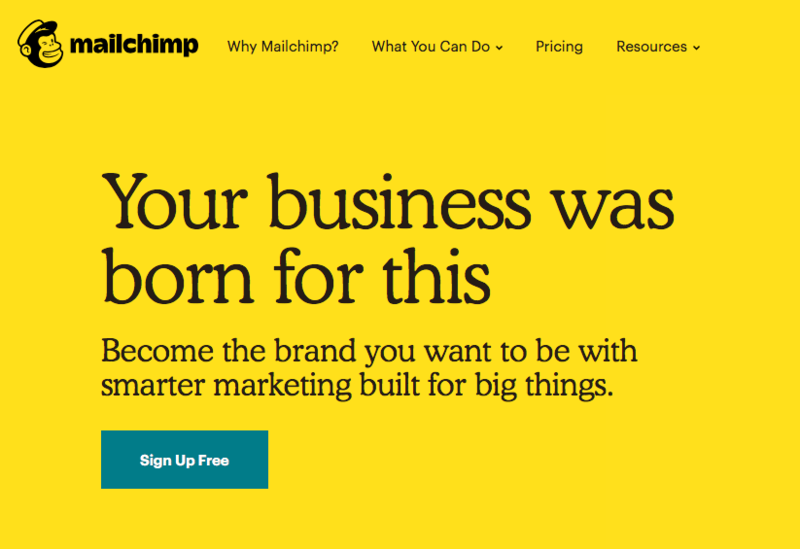 Like their emails, MailChimp just has a fantastic landing page and forms builder that work really well. 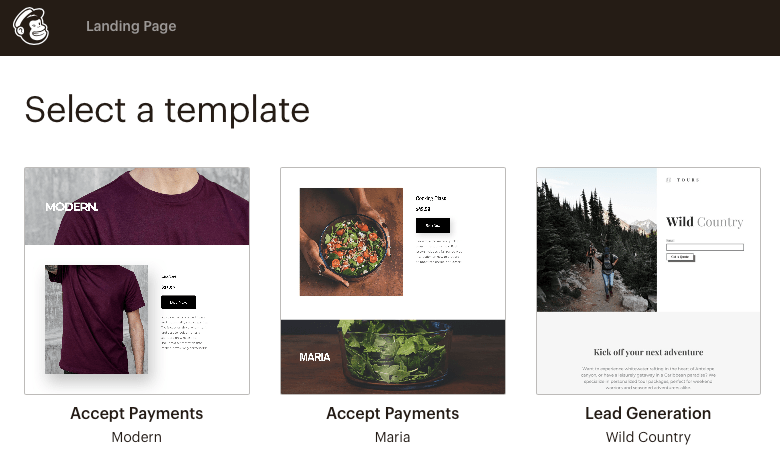 In terms of visuals and ease-of-use, MailChimp is hard to beat. Gist has multiple form types that you can create and display. Where MailChimp’s strength is form, Gist’s is function. You can set the forms created with Gist to display exactly when and where you need them to be. For instance, if you have a lead magnet that is specific to a certain page or category, you can set the form to only show up on a certain page. You can also augment when forms show up, how far down the page and many other display conditions to really put them right where they’re most effective. Our forms are highly-functional, but not enough to edge out the shear ease and design of MailChimp’s builder. MailChimp only offers tools related to email marketing and don’t have (or to my knowledge, plan on creating) a live chat function. Live chat is one of Gist’s most used tools on our entire platform. It takes less than 2-minutes to install and customize and you can use it for free. Without a feature to compare, this one definitely goes to Gist. With Gist’s paid plans, you can start creating certain bots, and with the Pro plan, you can create custom bots to put anywhere on your site or in app. 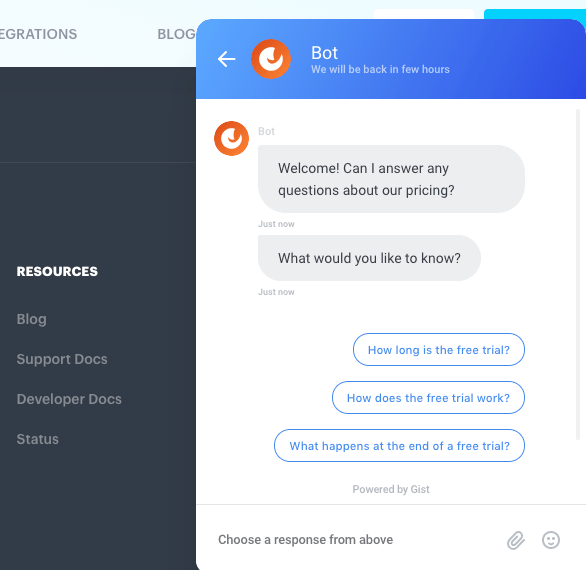 Gist’s bot builder can act like an after-hours rep or a constant interactive FAQ bot. Gist offers the ability to hook up a Google Calendar to our fully-functional meeting scheduler tool. You can send a link which directs to a page setup with the times you’re available and the titles and lengths of meetings you set. This is a fantastic tool to send in an email or mention during a live chat to get a sales call and close the deal. 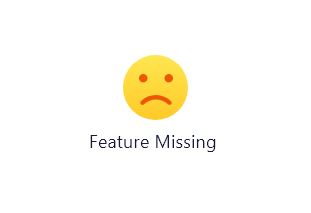 This is also a feature that MailChimp doesn’t offer. MailChimp doesn’t offer a meeting scheduler. 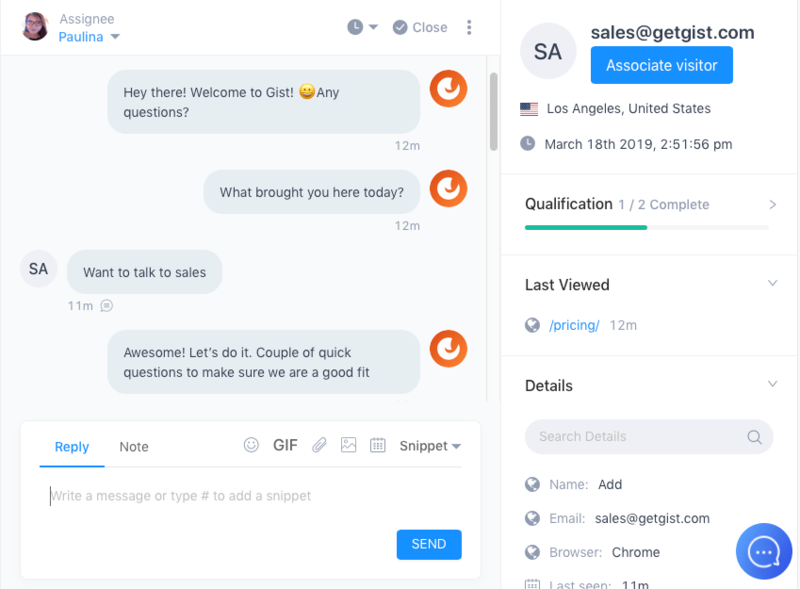 With Gist, you can send these meeting links with our email marketing tool, share them in live chat and even automatically book meetings with bots. MailChimp has basic reporting for their emails. You can see opens, clicks, etc.. However, once someone get’s to your site, users are either in the dark or have to rely on another tool. Gist gives you a much closer look at everyone interacting with your brand across your channels. This is another feature that isn’t available with MailChimp and is with Gist. 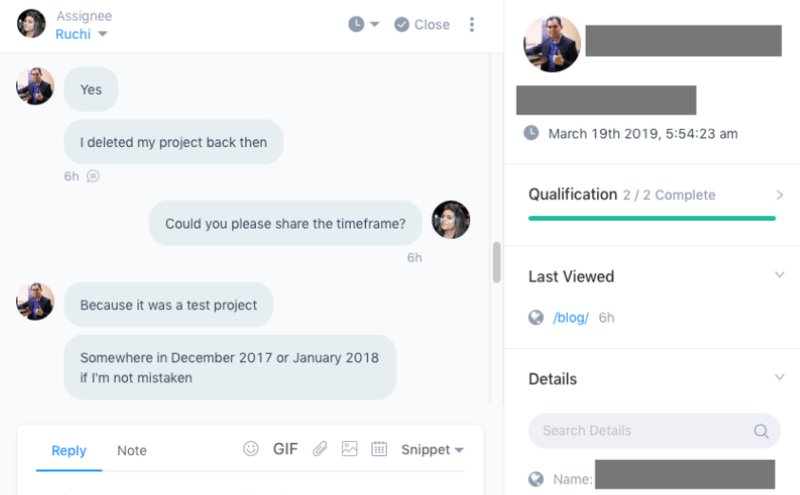 Our help desk is fully integrated with our live chat and can help alleviate customer problems by giving them a channel to connect with your support team instantly. Without a help desk feature available from MailChimp, Gist is the default winner. Gist users can create articles and organized them into our knowledge base feature. These articles are easily searchable by both your customers and staff. MailChimp doesn’t offer a knowledge base tool. Gist’s knowledge base is simple and effective to create a full, searchable knowledge base of any size. MailChimp is known as the best email marketing tool for those on a budget — and I totally agree. Up to 2,000 subscribers and 12,000 emails a month totally free forever. Not bad. However, once you need more from a tool than nice-looking emails and forms, it starts to get pricey. For the basic plan of $10/mo, you get 500 subscribers and a decent amount of features that wasn’t available in the free plan. But if you really want to unlock all of the segmentation capabilities, that starts at $199/mo. 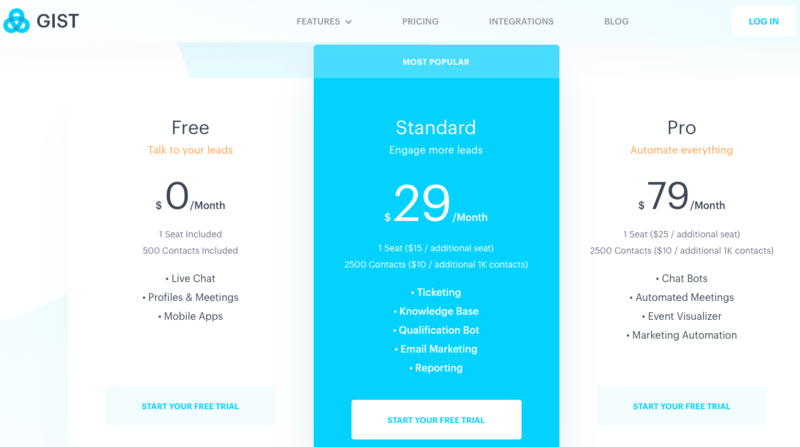 Gist offers more than double the number of tools that MailChimp has and our highest-priced plan is less than half at $79/mo. Full automation, segmentation, live chat, meetings the works. Everything. 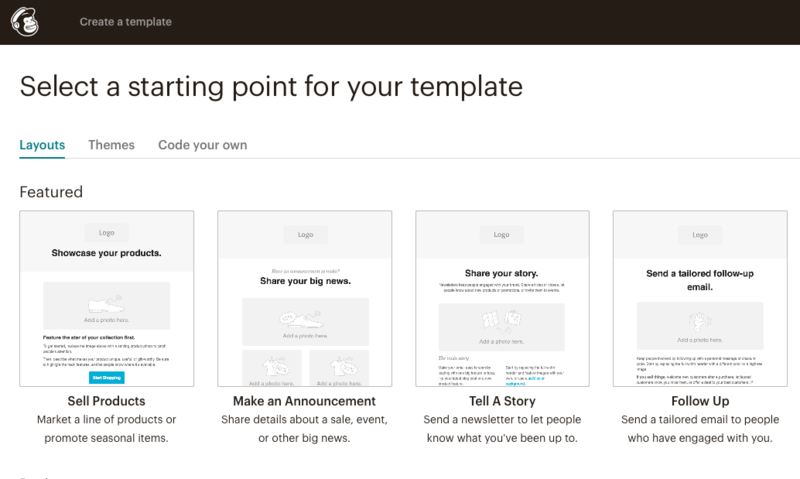 MailChimp has a great free email tool. Once they start charging, it becomes less valuable, especially when compared to the all-encompassing solution offered by Gist. MailChimp does email, forms and segmentation really well. And if you have a blog that’s just starting out or are a bootstrapping company that wants to go with the free plan, I could see the benefit. But with the number of tools you get with Gist and the price difference (especially when we look at MailChimp’s top-tier plan), it’s not much of a contest. Gist is the all-in-one solution for businesses. If you’re just looking for email, don’t need advanced segmentation, have less than 2,000 subscribers and don’t want all of the other tools — MailChimp is likely the answer. Almost every other business site would be better served by Gist. Interested in switching from MailChimp to Gist? Here’s a guide for migrating specifically from MailChimp.